The new NatWest T20 Blast season arrived with a fanfare of trumpets, fireworks, jugglers and dancing girls last Friday but the enduring image of the opening round of matches will be that of Alex Hales repeatedly launching the ball over the ropes in Notts Outlaws’ eight wicket win over Birmingham Bears. Hales hit maximums from six consecutive deliveries on his way to scoring 86 not out, before dashing to the airport to fulfil a hastily-arranged commitment with the Indian Premier League. The absence of the big-hitting England international will be a blow to the Outlaws this week but Samit Patel feels it will only inspire one of his team-mates to step forward. “Alex has had a great start to the season and obviously getting called up to join the Mumbai Indians is a great achievement for the club and for him,” confirmed the all-rounder,” he said. Patel had the best view in the house last week, standing at the non-striker’s end as Hales went on his run-spree. “I had a bit of neck ache watching the ball flying everywhere and seeing where it went,” he laughed. “It was absolutely amazing to see Alex smash it out of the park and to know it was a televised match as well, so everyone around the world could see it. 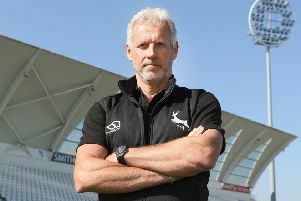 The Outlaws again have home advantage on Friday evening, with Yorkshire Vikings providing the opposition and Jason Gillespie’s side will be looking for a little bit of payback after Notts prevented the Vikings from reaching the knock out stages last season.